Harry Potter lite. The Warrior Heir reminds me more of Harry Potter than anything else. You have a normal boy who finds out he's a wizard, strong friendships, significant adult characters, and a big fight. It is "lite," because it lacks the depth and subtext that makes Harry Potter stand out. Regardless, The Warrior Heir is good fun. 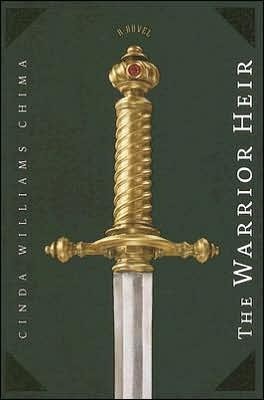 Cinda Williams Chima is a master at world building. With The Heir Chronicles series, she has created a world where wizards are at war with one another. Based mostly in England, rival clans have a tentative peace which they maintain by "fighting" each other in a game. Warriors, a person born with a warrior stone, are the wizards' pawns, raised to fight each other to the death in the clan tournaments. Warriors are hunted their entire lives - by clans seeking to train a warrior for the fight and by clans seeking to kill the other team's warrior. I loved reading about the history, politics, and the different magical powers of the Weirlind people. The fantasy world is complex and quite confusing if you rely on what I wrote above, but Cinda does a fabulous job explaining it. The world is introduced gradually throughout the book. I never felt like there was an info dump but I also never felt so confused that I was irritated. It was the perfect mix between knowledge and mystery. In general, the book was paced very well. Action scenes were spread throughout the story, each introducing Jack further into the Weirlind world. I also loved that there were lots of plot twists that left me dropping my jaw. You can guess the basics of the ending, but I was very surprised at how it got there. Like Harry Potter, Jack is supported by his best friends, Will and Fitch, and has a maybe girlfriend Ellen. I was blase about their role in the book. It feels ubiquitous that a teenage adventure story has to be about a boy and his friends defeating evil. Why do friends have to tag along? Not that it's bad, but it feels like a formulaic rule. Jack's mother is totally clueless and is even more of a pawn than he is (typical cardboard, absentish parent). I did like his enchantress aunt Linda and his mentor Leander. Leander was a highlight of the book because you couldn't tell if he was good or evil. My main problem with this book was Jack. He was a nice kid, but very flat. You could argue that Harry in Harry Potter is also a flat character. Unlike Ron and Hermione, who have well-defined personalities, Harry is more blank. Perhaps to make it easier for the reader to project themselves into his shoes. But unlike Jack, I loved Harry and came to understand the subtle nuances of his character. I never connected to Jack. And because I didn't care about Jack, in turn, I didn't believe the book. Despite the wonderful world building and my enjoyment of the story, I could never quite turn off the little voice in my head that says "This is nice, but it's just a book." A truly good fantasy adventure should totally engross the reader and make her forget that any other world exists. The Warrior Heir was a fun story and an outstanding debut, but doesn't rise to the level of truly special.. I am intrigued by this book. The fact that it is similar to Harry Potter. I have had it for ages, so I must read it soon. I attempted to read this book several times, but kept putting it down and forgetting about it. Eventually I DNFed it though I do know a few kids who really enjoyed this series. I just couldn't find anything to hold my interest. Glad you did better than I did! Harry Potter lite--heehee. Come to think of it, Harry was a little flat at the beginning, before he grew up a bit. I've heard great things about this series, though, and might have to check it out. Plus, I do love good world-building. Hmm... I never developed the HP fascination, and have only read the first book though I have watched all the movies. I don't think this one is for me. Sorry to hear the connection with Jack was a bit lacking though. Say what? Reminds you of HP? That's all you had to say to get me interested. Though at the same time, it does in some ways make me a bit weary because we already have a story like HP and it's AWESOME and anything else that seems similar will always fall flat in my eyes. Too bad this one fell a bit flat for you too. I read Cinda's other series and LOVED it. But this one is quite different. I have the boxed set and look forward to giving it a try. She is phenomenal with her world building though! I'm super curious about this series because I really love her other one... I've heard it's not quite as good (this one being her first book and all), but I think I definitely want to check it out at some point.